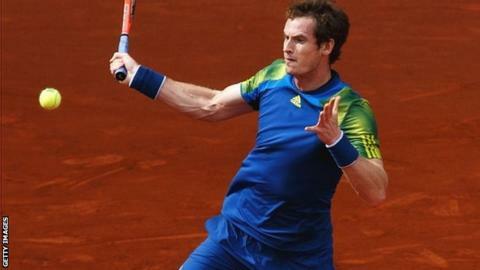 Andy Murray was made to work hard for his 400th career win as he beat Germany's Florian Mayer in his opening match at the Madrid Open. Murray struggled physically as he saved five set points in a dramatic opening tie-break before coming through 7-6 (13-11) 7-6 (7-3). The Briton, who had a bye in round one, will play 16th seed Gilles Simon next. Roger Federer, Maria Sharapova and Serena Willams all won, but Novak Djokovic lost to Grigor Dimitrov. "This is the thing about these Masters 1000 events, particularly for the top seeds who get byes through Round One: your first match is likely to be tough. And while Mayer performed as we knew he could - loads of deception, slice and skill - Murray dealt with him impressively, particularly when he saved the series of set points in the first tie-break. A job well done." Murray, looking to kick-start his clay campaign after an early exit in Monte Carlo, grimaced while grabbing his lower back and looked exhausted during a tough two hours and four minutes. "I was struggling," said Murray. "I think both of us were at the end of the first set, there were so many long points. "I was finishing a lot of the points very out of breath, and I think that's a combination of the way the points were going, but also it's different playing in altitude. It takes time to get used to that." He added: "I felt like I hit the ball very well today, very few mishits. I just didn't return so well. That was the only thing I would have liked to have done better. "Apart from that, I moved very well, which I didn't do in Monte Carlo, so that's a big improvement." After failing to convert three break points in the opening four Mayer service games, the Scot, who turns 26 next week, came desperately close to losing the set. Mayer, the world number 26, recovered from 5-3 down in the tie-break to earn a succession of set points, but repeatedly went for too much at the key moments and Murray clung on before firing away a forehand on his second set point to nick it. It was the 29-year-old from Bayreuth who was making the running, though, and he broke to love at the start of the second on his way to a 3-0 lead. The set appeared to be gone but Murray battled back valiantly with three straight games to level at 4-4, and forced a second tie-break which would prove more straightforward than the first. Murray took the opening point against serve and was never threatened, closing out the win on his second match point with a backhand pass. "It's nice - 400 matches is a lot of matches and I hope I can play a few more in my career," he added. "There's not too many guys have over 500 wins." Federer earlier returned from a two-month break to beat Radek Stepanek 6-3 6-3, and said: "I didn't think I played incredible, but that's not what I was expecting myself to do here, but I didn't play bad either. "Overall, I'm very happy, because he has caused me difficulties in the past." In the women's draw, Williams made it through to the third round with a 6-2 7-5 win over Lourdes Dominguez, and was asked afterwards about comments made by fellow American Sloane Stephens. The 20-year-old beat Williams at the Australian Open, and last week told ESPN magazine: "She's not said one word to me, not spoken to me, not said 'hi', not looked my way, not been in the same room with me since I played her in Australia." Asked for her reaction, Williams, 31, said: "I'm a big Sloane Stephens fan and always have been. I've always said that I think she can be the best in the world. I'll always continue to think that and always be rooting for her." Stephens later said on Twitter she had been "guilty of being naive".